Scaffolding is a temporary structure used to support workers and materials and lift them up to access work areas on construction and maintenance sites. They are common tools that have been used for many years, but have been the cause of thousands of serious injuries and fatalities due to their vulnerable nature. Scaffolding use should be left to professionals with proper experience and knowledge, and professionals should receive scaffolding training to be prepared to work with scaffolds safely and prevent serious accidents. Scaffolding safety is closely analyzed by OSHA. Scaffolding issues are always included in OSHA yearly top 10 safety violations, underlining the importance of proper scaffolding training. CertifyMe.net offers a complete scaffolding safety training course for any employee who requires this specialized instruction. Click here to view our courses and pricing – it’s easier than ever to get all of your employees OSHA complaint in less time than you think! How Important is Scaffolding Training? Consider this: in 2017, scaffolding related incidents were the 3rd most common safety violation. OSHA sets stringent scaffolding requirements, and for good reason. Every year, there are a few dozen fatalities, along with hundreds of injuries. Knowing how to set up scaffolding and properly use it can spell the difference between a job well done and disaster. CertifyMe.net has a comprehensive OSHA scaffolding training program, designed to help you and your co-workers become more aware of the unique safety hazards related to scaffolding use. CertifyMe.net offers four different interactive courses all designed to teach professionals of the different aspects of scaffolding safety. Choose the course that best suits you and your work environment and receive the information you need to reduce the number of accidents in your workplace. Scaffolding can be very unsafe when entrusted in untrained hands. It is an employer’s responsibility to ensure they aren’t forcing their workers into a hazardous environment, and to provide the thorough training workers need to protect their safety on the job. The scaffolding courses from CertifyMe.net cover each essential component of scaffolding safety through our industry-specific course options, which include safe construction scaffolding, suspended scaffolding, and supported scaffolding. Each OSHA scaffolding course teaches workers how to use scaffolding safely, how to work in busy environments and handle work tools safely while on the scaffolding, and how to recognize hazards to avoid accidents. All of this information is taught via interesting content and visuals in a logical step-by-step sequence to ensure optimum absorption and retention of the information. Employers who work with scaffolding can benefit from our courses as well. Comprehensive, OSHA-compliant training will no doubt help reduce the number of accidents on your worksite and will help keep your workers safe and informed of safety hazards. This in turn, will help you avoid OSHA fines and serious legalities. The interactive online course from MARCOM offered by CertifyMe.net teaches professionals how to work with supported scaffolding safely, and helps facilities remain compliant with OSHA’s Scaffolding regulations (29 CFR 1926.451). Scaffolding is the cause of multiple fatalities and more than 10,000 injuries every year on worksites, and it is imperative for workers to receive the specialized training they need to prevent accidents. Construction and maintenance employees who work with scaffolding must be trained on how to safely set up and use scaffolding platforms. The Supported Scaffolding Safety course teaches workers how to recognize hazards, and how to reduce risks of working with scaffolds. Through the combination of full-motion video, audio, text and colorful graphics, workers receive the information they need step-by-step in the most effective format for learning and retention. If you regularly use scaffolding at your job, sign up for this OSHA scaffolding training today! Construction professionals receive the tailored and industry-specific scaffolding training they need in the online Supported Scaffolding Safety in Construction Environments course. Workers not only learn how to erect and use scaffolding safely and recognize dangers, but they also become 100% compliant with OSHA’s Scaffolding regulations through our effective and cost-efficient program. Professionals and employers can help reduce the number of fatalities and serious injuries that occur on worksites every year involving scaffolding. Audio, full-motion video, text, and colorful graphics are used to teach workers every important aspect of scaffolding safety, and to ensure they understand and retain the information through easy-to-follow instruction. Once you’ve completed your CertifyMe.net OSHA scaffolding training, you’ll open plenty of job possibilities. And best of all, your training travels with you! The Suspended Scaffolding Safety MARCOM course from CertifyMe.net fulfills OSHA’s Scaffolding regulations and training requirements for working with suspended scaffolding safely. It can be used to help workers prevent accidents and reduce the number of fatalities and injuries involving scaffolding on worksites, which amount to over 10,000 incidences every year. Whenever a worker leaves the ground to complete tasks, the risk of accidents increases, along with the severity of the accident. The Suspended Scaffolding Safety course from CertifyMe.net ensures workers learn everything they need to know to use and set up scaffolding correctly, remain safe while working, recognize hazards, and prevent accidents. You won’t find a more informative or cost-effective course on suspended scaffolding safety on the market, that also ensures OSHA compliancy. CertifyMe.net is all about getting you OSHA compliant, quickly but without cutting corners. We’ll cover all the necessary OSHA scaffolding requirements in our Suspended Scaffolding Safety course. Online and self-paced, the course involves video, audio, and colorful visuals and text to deliver the information and ensure it is retained. Again, a construction work environment presents unique challenges for any worker – and the ability to properly use scaffolding at a construction site isn’t just beneficial from your employer’s point of view. It’s also required that you have OSHA scaffolding training as well. This course offers a thorough overview of using scaffolding for construction work. If you or your employees work in the construction industry and use suspended scaffolding, this online course is for you. Through the use of stunning visuals and text, audio, and full-motion video, workers receive a comprehensive overview of everything they need to know to erect and use scaffolding safely, recognize dangers, and prevent accidents. Whenever a worker leaves the ground, the potential for serious accidents increases significantly, totaling more than 10,000 injuries per year. To fulfill OSHA’s Scaffolding regulation completely, employers must provide adequate training to their workers that teaches all the essential steps of scaffolding safety in an easy-to-follow format they can understand and retain. No other suspended scaffolding safety course on the market ensures OSHA compliancy, top quality training, and the convenience of online learning like ours. 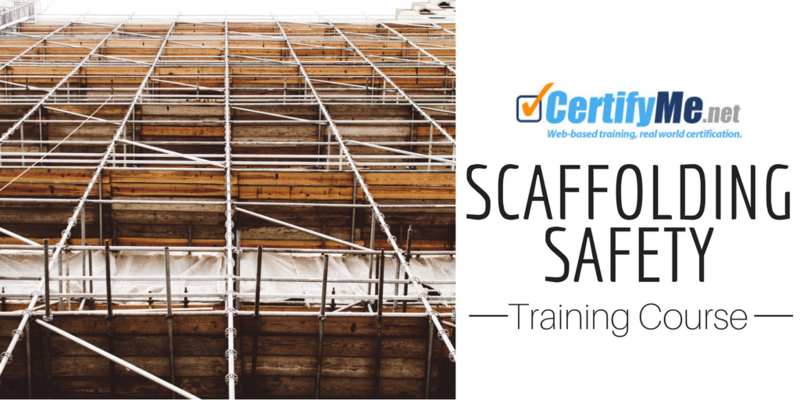 Sign up with CeritfyMe.net Today – Get the Scaffolding Safety Training You Need! Let CertifyMe.net give you everything you need in a step-by-step roadmap to become an expert in scaffolding safety and prevent accidents. To learn more about the scaffolding training courses from CertifyMe.net, contact us. We’re here to help you become OSHA complaint with scaffolding use, for both construction sites and non-construction endeavors. It doesn’t matter what your particular job title is – what matters is that you get your OSHA scaffolding training right away. If you have any questions about our scaffolding training, or would like to speak with our OSHA scaffolding requirements experts, call CertifyMe.net today at 1-888-699-4800. Thanks for visiting CertifyMe.net! We’ll help with all of your scaffolding safety training, and other OSHA compliance training requirements.